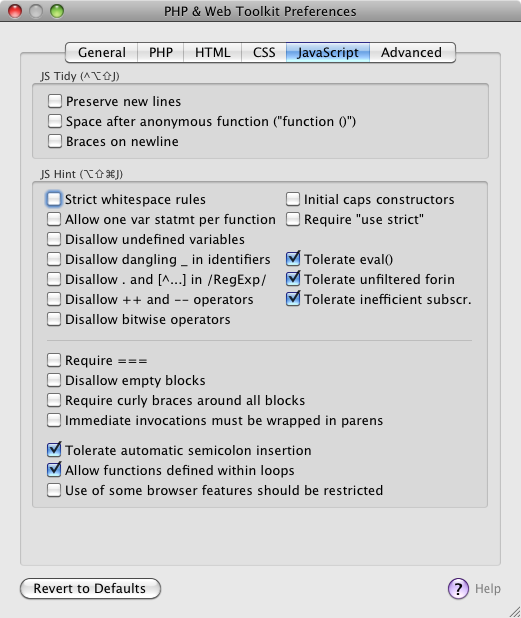 I had a quick question…I noticed that when I use the html tidy option it automatically changes my doctype to strict when I would like it to stay in transitional…is there any way to change that so that it doesn’t change my doctype declaration? thanks in advance for any advice…ps. I love this plugin minus this small issue. 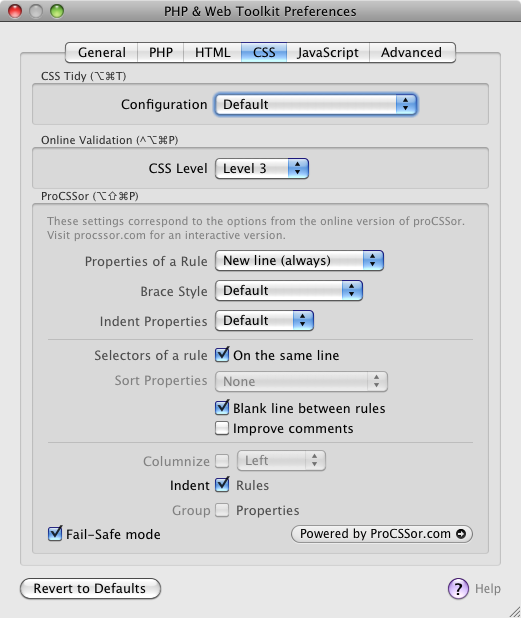 which config setting do you use for HTML tidy? Otherwise send me the HTML-file, then I’ll have look. So Coda runs without the plugin normally? The plugin crash happens at startup? Which OSX-Version and which platform (ppc/intel ~ 32bit/64bit) do you use? Do you want the crash report? OSX 10.4 is 32bit – maybe 10.4 is the problem, since I haven’t been able to test it on 10.4. I’m afraid the code isn’t compatible with OS X 10.4 (according to Xcode) – so if you’ve got any chance to upgrade to 10.5/10.6 the plugin should run without problems. I cannot save settings in coda after install your plugin. Anyone else with this problem? There ist no “save”button on global coda-settings. And no, i doent find somethink like “dechipwreck…”. Okay, misunderstood :) Coda preferences can’t be saved. Will try to find out if it’s got something to do with the PHP Toolkit and if so, how to resolve. If someone else has the same problem – don’t hesitate to post a comment here. The about-windows says v0.96 – is this the latest version? Eh no, the current version should be 1.62 .. v0.96 is much too old. 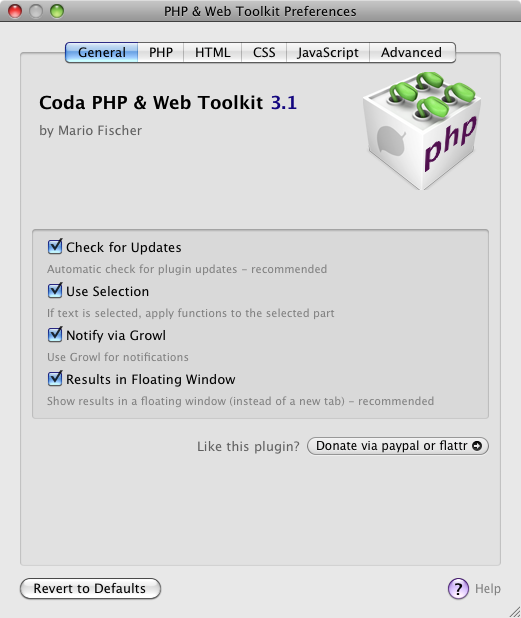 Simply go to: “your user folder -> Library -> Application support -> Coda -> Plugins”, delete the old PhpToolkit plugin bundle, download the current one and double click it. This should work. 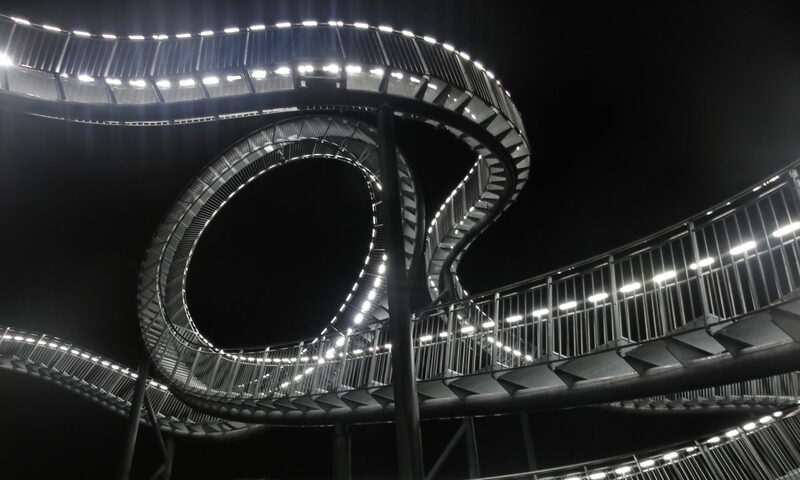 Absolutely awesome. Thanks for this! This version appears to ignore the ‘Default Line Endings’ set in coda’s preferences? okay, I’ll have a look. One question though: Was that any different in the previous versions? [UPDATE Jan,25th] And again – no API function from Coda to read the current line endings.. But I’ll try to find a workaround of course..
interface and the way it’s function. It works great on my G5, thanks for the PPC compatibility. This is fantastic. Thanks so much!! This error will cause instability and it is recommended you quit and relaunch Coda. Could you look at the Console output – there should be some more lines .. Or send me the file if possible? [Update Nov, 26th] No reply until now – so I’ll assume it hasn’t happened again. Otherwise: Send a mail or comment here. I got the same error “(NSInvalidArgumentException) *** -[NSCFArray insertObject:atIndex:]: attempt to insert nil” here is what console saids. I figured out the problem, if you dont save the document you get that error, once you save it and run it again it works fine. Thx! Just updated the docs – I assume the document was new (=empty before you entered text and saved it) ? The behaviour of the functions is a little bit inconsistent: php validation and php strip comment take the current editor buffer (regardless of what’s on the disk) – the other functions use the file on disk (so if you don’t save the file might be yet empty). [UPDATE 1:] The beta version now handles this more graciously (beeps or tells you that you should save the file before). [UPDATE 2:] One solution would be to save the file automatically (maybe not what everyone wants), another one to create a temp file with the buffer contents (nicer but creates lots of new error possibilites..:). I’ll have a look. Thanks for the reply, (I got your notification). The document was new but not empty. I created a new document and pasted code from another document and did not save. I used the tidy functionality and that is when I got the error. Once I Saved the file it worked. Thanks for the update though. Yes..that’s what I meant: The file on disk was still empty. The beta version (see above) doesn’t have this problem anymore – you can automatically save the file before running CssTidy or PhpTidy. HtmlTidy works now with the current buffer contents (regardless of saving or not). Awesome. Works a treat. Keep up the great work. Now…: “Go to Line” is a bit tricky if the erroneous line is out of focus. “Errors parsing – ” is the “correct” answer from php, since the file is directly sent to php (without filename). What happens, if you open the Terminal and enter “php -l yourfile.php” ? With the plugin, I get the ‘Errors parsing – ‘ message. So I guess the plug-in is picking up the second error rather than the first? if there’s anything else I can try, please let me know. Yes, it seems the first (and much more interesting) error is either not visible or somehow discarded. So could you try to restart Coda, maximize the Coda window and drag the error-window at the bottom right handle? Just uploaded a new beta version- the window handling is fixed now. No luck I’m afraid… I downloaded the beta and tried that, and can see that the error is now presented in a textarea, but it still just says ‘Errors parsing – ‘. Let me know if I can do anything else to help identify the issue! Okay, please download the current beta again, I put in some debugging code. 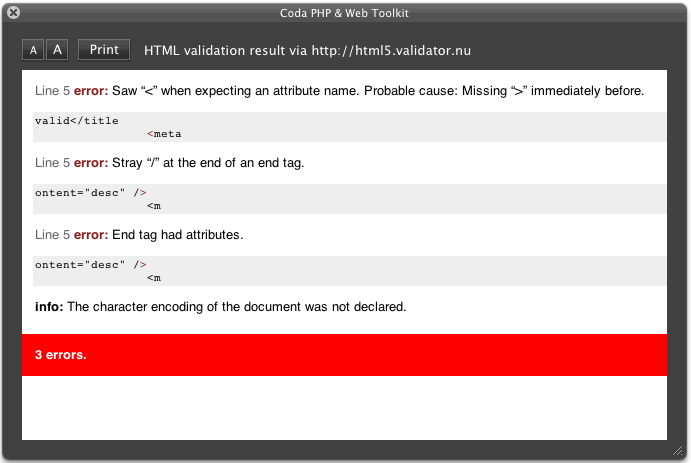 Try validating some erroneous php-file and open the Console (viewing all messages). The error is being reported there like this “Coda PHP Plugin – PHP error: Parse error: syntax error, unexpected T_STRING in – on line 9 Errors parsing -” – what does the Console say? And: what PHP version is reported in the “About…”-window of the plugin? In About PHP Toolkit, local PHP Version is PHP 5.3.0 (cli). Okay, finally found the error: If you use a php.ini-file (like /private/etc/php.ini) and set “display_errors” to off, this happens. Hey, for some reason, with certain files, I’m unable to save them after using HTML tidy. Permissions are correct, so I’m not sure what’s going on. Any ideas? [Updated Nov, 12th] Had seemingly nothing to do with the plugin – a filesystem problem. Very awesome, thanks a lot! Is fixed in the latest version. I’ll have a look :) At the moment I’m trying to integrate the W3C Validator which is not that easy, since the API misses some methods needed..
Any idea when the next version is coming to fix the issue with invisible text when using the tidy? Hi – I suppose in about 2 weeks I’ll find some time to update the plugin. At last! This means I can use coda as a proper development tool :) Thank you. After I run php tidy in 1.6.4 all the end of line characters start to show – switching invisible characters on / off does nothing. How can I hide them? Question answered – in the next update this bug will be fixed. Great plugin, thank you! Coming from textmate, this is exactly the thing I missed (and which caused me to stay in textmate). I hope ISO-8859-1 support is coming soon. UTF-8 is great of course, but if you have older sites that you don’t want to convert, more encodings would help. Thanks! As soon as the Coda API supports something like “getCurrentEncoding” I’ll put this possibility in the plugin. Just wondering, I’m trying to use the Tidy HTML feature, but I’m getting “Error – No output received” … I’m on Mac OS X Tiger – does it matter only for the PHP features, or also the HTML? What to do? Yes, you need at least Leopard (or php5 installed) for the PHP-specific features (I updated the requirements above). But HTML tidy should work nevertheless. Could you try it out with another HTML-File? Or send me one per mail, which makes problems.. I hope this can be fixed, I’ve been looking for a PHP plugin for a while! this shouldn’t have to anything with the 1.6.3 release. Do you encounter this also with other php-files? If possible, could you mail the offending php-file to me? Another thing to check: Open the Terminal, enter “php -v” (without quotes) and return – what result do you get? I’ve tried it on multiple files, including nearly empty ones. ( fails) It might be that my php version is out of date? Does this work on php < 5? Yes, php4 – that’s the problem. With php5 everything should work. Which OS X version do you use? In the current Leopard release php5 is included. You can install a more recent php-version with MacPorts, but therefore you have to edit the path to php in the first line of the “phptidy-coda.php”-file. Yes I’m on Tiger, that’s why. I’ll look into upgrading. Thanks again for your efforts and support on this plug-in. Thank you for contributing to the Coda community ! Using this plugin daily, saves me alot of time switching back between terminal windows! Glad to hear that – as soon as the Coda-API offers some advanced functions, more features are to come..
Would it be possible to add a feature which lets you find an opening bracket’s closing bracket (and vice versa)? I know Coda has a feature which highlights them but its no use when there is lots of code between the brackets.! The bracket highlighting is at the moment not possible – for the Coda-API allows only a limited set of actions like replacing text, opening files etc., but no features like highlighting text. Thanks for taking the time to do this, just starting to use PhP with Coda and this is a welcome resource! I’m not sure how you wrap your brain around this stuff, but keep it up! Great script, works as advertised. Thank you!!! Do you know how I could add a keyboard shortcut to run this? Simply use the keyboard shortcuts in OS X System Preferences and add a new shortcut.. That’s the most easy solution I think.